This topic will hold dungeons I've used or am using, and it will be linked in my signature. The images will be in edit mode to show the destination and/or pivot of the red and blue guards respectively. They will be dungeons I have saved, although I feel no need to post an image for proof of saving. I may or may not leave notes on creation thoughts and iterations. 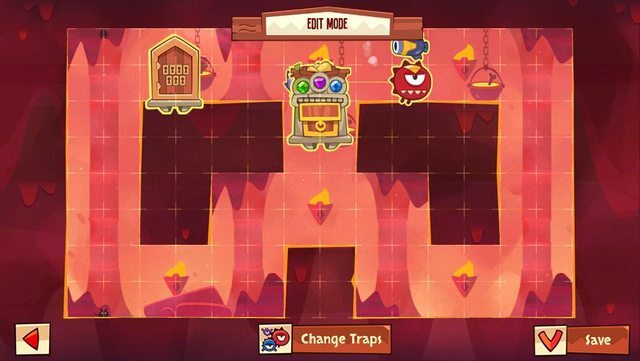 Only reply to this thread if you care to discuss the specific layout or trap positioning that I have used and make a reference to the specific dungeon number. *Note: Since there's a 10 img limit to each post, I will reserve the first 4 replies giving me access to putting up 50 images (initial 10 + (4x10)). I ran into a base that had the cannon higher, and the door farther, you had to do a low wall double jump to not get hit. I started playing around with close positions to see how low I could do the jump without the initial jump in. Found out it could be pretty low. I started testing the positioning for the fly to force this low jump as well. Then I worked on the spinner. The spinner location shown is one of two possibilities. You can move it 2 units to the left and 2 units up and the pivot should be 6 units south. This will make a faster larger arc that can protect the right column a little bit more. I settled on the slower position as it makes the window for the low jump tighter (if only by a little). First layout with a pit. Note that there are two spinners in the same location. There were plenty of recorded setups for this dungeon and after playing around, the upper left corner placement had a good rep for a reason, it forces a fast jump to start, and drop jump. This is all without traps. I've seen people place the spinner to kill at the door but felt this was redundant because if they didn't do a quick jump, they would die anyway, although it would take longer (and thus maybe detract high skull count). I messed around until I came to this spinner positioning which causes the player to aim at the hanging corner for an instant drop jump. Any other jump will die to the spinner or land in the pit. I used to have a seeker bird originally since it came with the basic traps, but after skulling for a bit, the two spinners limit movement better. The homing cannon used to be in the wall at the corner but the current placement forces the drop jump to be pretty fast while still preventing a slow slide into the drop jump. I noticed a skidding glitch that I wanted to use or exploit. I created this setup to do so (detailed in this thread: http://forum.kingoft...-and-cant-jump/). The fly in front helps keep the cannon from always being the one disabled by deaths. The cannon is really punishing in this position if you don't jump early enough. The spinner in the linked thread was my first placement. This position is better as it forces the initial long jump to be closer to perfect since it tightens the window for the ceiling jump. You can have two spinners in the same location instead of the fly as well. Overall I don't think this is a great defense, however, it was fun to use and see people get stuck skidding across the bounce platform in the replays. 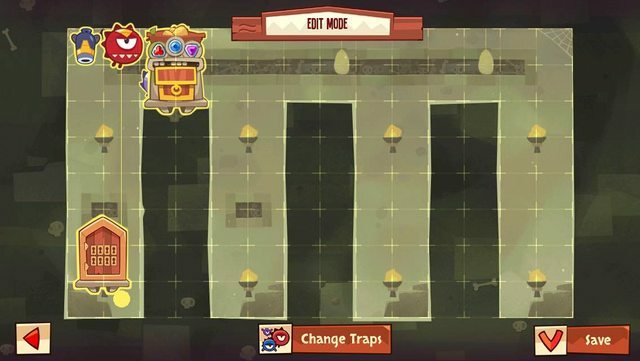 This layout without any traps has a harder wall jump or high jump to get to the totem. I considered different placements for the red guard to protect the corner, however timing it seemed trivial. So I settled on the red guard forcing the low wall jump. I have a couple other positions for the spinner, but they require the door not to be in the corner. I chose the spinner's slow path with the tighter wall jump over the fast path (looser wall jump, however it can punish on the left side of the base decently well). This is mainly because you avoid the left side by wall jumping up the right column only. The homing cannon usually has a goto position for forcing a really tight low wall jump. However, after further testing I feel this position, while having a looser low wall jump, protects the corner required for the wall/high jump way better. This placement forces 2 hard jumps, rather than 1 really hard jump. Trying to get through all three involves a low wall jump to start, another standard wall jump off the corner, a homing cannon jump, and a high jump from the corner. If you miss the high jump, you'll get another shot with a long jump into wall jump but will have to deal with the homing cannon and spinner again. Note that there is a regular cannon right where the red guard is, and it is pointing south. Nothing new here really. Best totem spot is in the center open area forcing a high jump. I tested out alternate open areas to the left and right, 2 units from the side walls, however, they were much easier to wall jump to. The saw is in a great place to further tighten the high jump needed to reach the totem. It also forces the jump from the right corner only (you can make the jump from either left or right without the saw). The red guard forces the low wall jump. I tried having it go back and forth to protect both corners, however timing the jump was trivial. The regular cannon forces a perfect low wall jump. 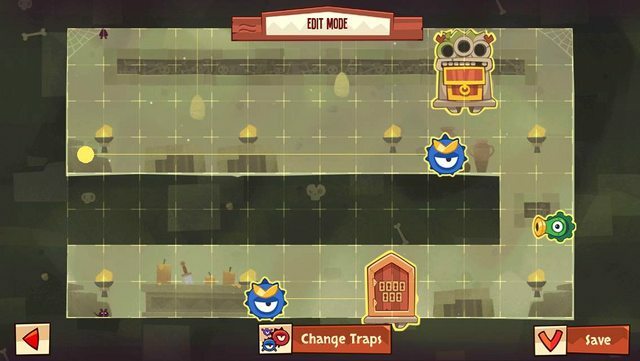 I was trying out positions to protect the corners as well, and may ultimately change it, however, if the cannon is the only trap active, the fact that you can access the jump from either corner makes it rather simple. Combined, the three traps force a perfect low wall jump, a timing wait to climb up the column and safely reach the right corner, and finally a high jump off the right corner. 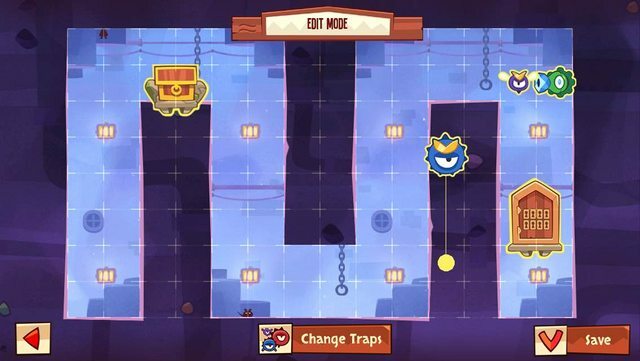 I initially had the saw to the right side of the totem, however you could reach the left corner with 2 jumps after the low wall jump. Moving it to the right forces the thief to wait and discover the window to climb up safely. Thieves that end up gliding to the sides will find that coming back from the right side is pretty easy, but the left side requires really good timing. Note, there's a regular cannon pointed west underneath the seeker bird. This doesn't hold well vs a disable trap potion, however, it was fun to make and will usually net the first 7 deaths at least. I wanted to use this red guard positioning. The red guard position and direction works really well and needs 3 jumps to not die to it. I tried positioning the other traps to help keep the red guard alive (i.e. lure them into dying into the other traps). The cannon by itself can easily be beaten with a drop into the center column followed by a timed high wall jump. The cannon does however make the east and west directions decently tough. The fly loses out to the east and west positions but makes the center column climb tough. The red guard is in a great position on its own. Defending all three directions and making a hard to enter gate. You can also shift the door and the red guard over one unit left, forcing the thief to enter the center column and making it difficult to climb out. I went with the horizontal layout making the three jumps really tight. All together, the solution requires: Somewhat fast start jump, close to perfect jump to avoid a bullet, seeker bird, and red guard, another timed jump to squeeze between bullet and red guard, a delayed wall jump to time the next jump, which is a opposite corner aim into a high jump. This is similar to dungeon 4 up above. Cannon just replaces red guard, and spinner is adjusted for coverage near the totem. No high jump corner to protect here so the homing cannon feels significantly weaker here. I played around with delaying the low wall jump forced by the regular cannon but couldn't find other trap positions to match or be strong on their own. 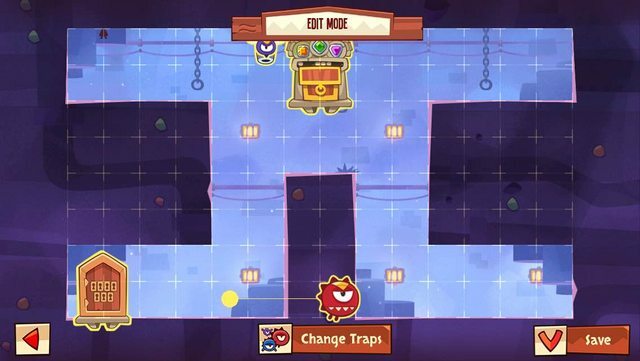 Same solution as dungeon 4, however the low wall jump is tighter and instead of aiming for a super jump, its just a couple timed wall jumps to the totem. This is the door and totem layout I originally wanted to use. It forces the absolute longest path. However, these trap positions are all far apart. Only the spinner is working with the other traps. The homing cannon forces a low wall jump and has a small chance to catch people jumping near the totem. The regular cannon forces a timing wall jump that is pretty tight. The spinner does the same thing for the right most corner although the window is not as tight as the cannon. The spinner also punishes waiting at the door (if homing cannon is disabled), and also punishes waiting for the regular cannon timing. 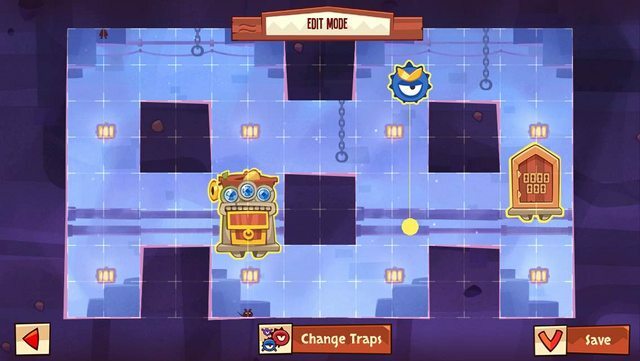 Overall, the full solution is, low wall jump, avoid the spinner, time the regular cannon jump, delay on the wall slide to time the spinner wall jump, and finally climb up to the totem avoiding the spinner's second revolution and the cannon (which is fairly easy). 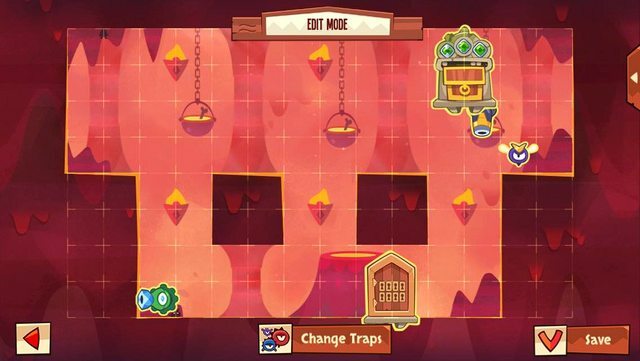 This is the alternate set of traps for this layout. The lower spinner is a position that is decently strong on its own by forcing a double jump that can't be solved by just spamming. The high spinner requires the fast start jump. Both spinners also protect the climb up the stair to the totem. The homing cannon in this position forces a tight window for avoiding the second bullet. Some people call this a homing cannon jump. However this position isn't the standard homing cannon jump. You can avoid the homing cannon jump by doing a low wall double jump to reverse direction and then change the timing on when you return. Combined, these traps cause many timing jumps. All together: very fast start jump, delay into a second jump that requires you not to hit the wall, then a slower low wall jump (this is the homing cannon jump), and then some delay wall jumps to climb up the stair. Next layout is pretty similar to my last layout. New trap sets though. I think it was about time I do some upgrading so decided this was a good place to try out the seeker bird race. The race is pretty tight however, anybody who can hit a low wall jump or low wall double jump will be fine (as well as anybody with a disable potion, since I'm doing construction on the red guard)! By the way, I wonder if people were surprised to see the bird moving on its own since the red guard was doing invisible pushing. 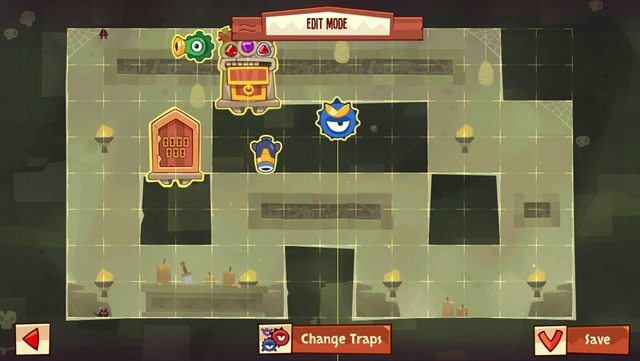 After looking at replays, the gang of thieves potion actually knocked the seeker bird out of the way, and the seeker bird flew off to the right. I laughed when I saw it, and will keep it in mind that this seeker bird positioning is week to the gang of thieves potion. Another note is that if you have the red guard push the fly from the north or south or west, the position is slightly different. Edited by Cylence, 28 August 2015 - 02:12 AM. I'm still in upgrade mode. This time, I'm upgrading the regular cannon (which is located on the upper left of the totem). I placed it there to obstruct view to the totem's gem sockets since it wouldn't be helping much anyway. If it finished upgrading it's pointed to the right to make the buzz saw jump harder. The buzz saw (located on the lower right of the totem) requires a wall jump with little room for error. 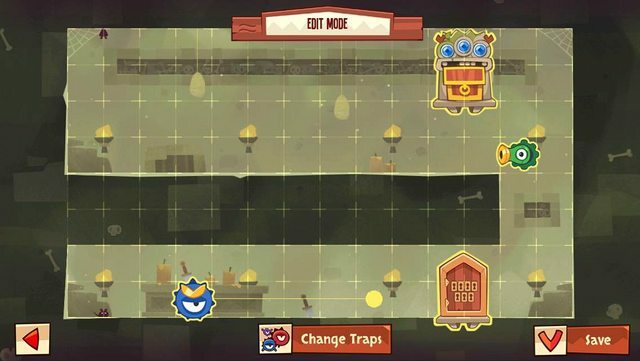 I considered placing the red guard to block the vision of the wall that the buzz saw jump needs to launch from, however, I decided that hiding one gem maybe more effective since disable traps would more likely be used if they saw a silver gem for the taking. The red guard is in one of my favorite positions that forces key timing when starting the level. Full solution is, fast start jump, timed jump next to red guard, jumping one more time to avoid red guard coming back, then a "jump of faith" to the totem. I've had this layout before (see #4). Cannon is still in a great position to defend the corner that you need to launch off of in order to reach the chest. Red Guard has been moved to protect that corner as well. Spinner is situated to force a low wall double jump and also protects the climb up the column as well as the corner. All together, the solution goes like this: low wall double jump to start. Timing jump off the left wall for upcoming column climb. Low wall double jump with enough height to hit the corner and wall jump up column. Should be now going towards the left wall again. Timing jump off left wall after a short wait. Jump over cannon shot. Jump of edge to wall jump to totem. After further exploration, I found some more decent positions, but wasn't happy to use them in combination with another spinner and homing cannon. Weakest trap is still the fast jump start spinner, however, it will net some kills a decent amount of time and end up being the one disabled. The lower spinner is probably one of the stronger positions since it covers both jump angles and provides trouble in the beginning. Leaving this as is. Out of 12 and 13, I think, 12 is better and would rely on it more. From here on out, gonna try to remember to use the link that sends you to imgur for the images so you can see the big resolution if you want to. Same layout. Note that the 2 spinners are in the same spot and have the same pivot. Found a position that forces only perfect low wall double jumps. I felt this was tight enough to dedicate two traps to it. Not only do you have to deal with the double jump at the start, but you also have to time your return. And should you miss the jump to the totem, it does a really good jump of punishing both the upper row and right column. Cannon still in the same great spot as in previous dungeons. Will probably be using this spinner positioning in other bases if I can. In comparison, the low wall double jump forced by #12's spinner has a wider window. I really wanted to combine this spinner position with #12's red guard and cannon, but I couldn't even get a single completion. 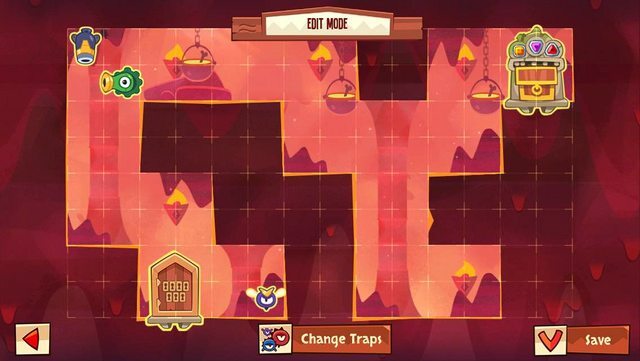 Anyway, full solution for this one goes: perfect low wall double jump, timed wall rebound, low wall double jump with enough height to hit the corner and wall jump up column, will need to time the second wall jump to not get hit by cannon, and then wall jump off the corner to the final wall jump to finish. Note: there is a saw behind the upper right of the totem. This layout is very challenging to create a good defense for. The totem can be reached from 2 different directions in any location. The best position I could find is in the center column. You can't reach it from underneath, although you can come from the left and the right. After testing individual positions for each of the traps, the saw had no great placements since you could always go the other way. There are two positions for the cannon to do decent on its own, however, the red guard has the strongest individual position. So I chose to go with the red guard, and structure the other traps around keeping it alive, just like in dungeon #6. 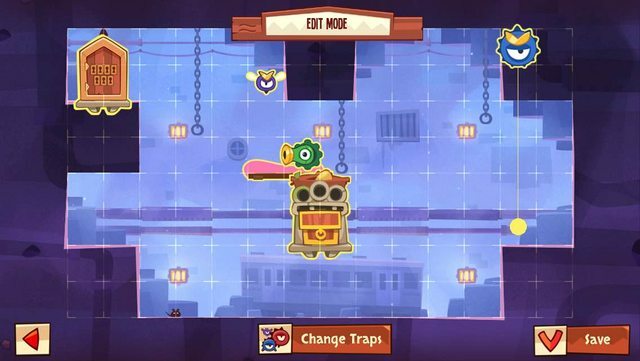 The saw replaces the bird, and although it doesn't tighten up the "thread the needle jump" as much as the bird did, it does a better job of defending if the red guard gets disabled. 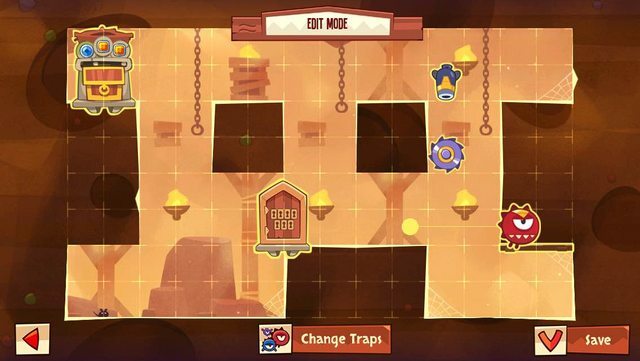 This set forces a key jump even if any one trap is disabled. This will not hold up against a disable pot and a 7 death disable suicide. 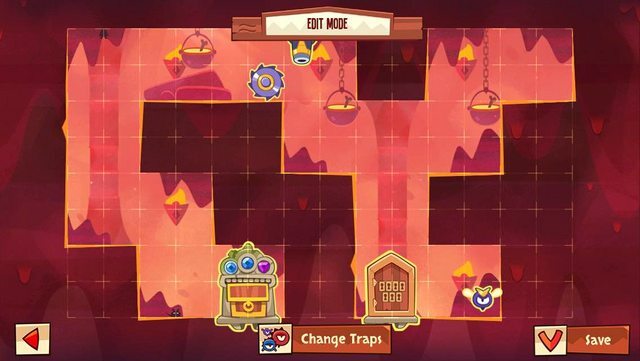 Combined the trap set will force the player to go all the way right and come back and face the traps again (they have the choice to tackle from the left or right). The solution is almost the same as #6 except no need for a high jump. I can't wait to move out of this dungeon. Update: This defense was actually pretty decent for such a horrendous layout. It didn't hold up well to potions though as expected. It usually still got at least 7 deaths when the disable pot used, however the gang of thieves pot was strong against this setup. Finally moved to a new base. The previous one ( #15) was tough because the totem could be accessed from more than one direction. This new layout has two possible totem locations: the upper left or the upper right. If the door is placed on the lower section, the path will involve going through a stair to column with a fork to get to the top row. Seeker birds do well by themselves when you can corner the thief. This seeker bird position here is decently strong and will force the door to start on the lower right side. I tried both locations for the totem and ended up going with the upper right because it requires a third jump during the column climb where the left position only requires two jumps. Homing cannon get its regular "defend a corner on a column climb" position. The spinner is positioned to cover the lower two jumps and the tail end of the last jump. Even on its own, the spinner can kill careless thieves who don't care to time it well. The spinner can started south or east for different timing. I chose the south position after testing with the seeker bird, since it forces some juggling instead of going straight through after dodging the bird. Full solution: fast start jump (not max speed as it will die, but a little slower), ceiling jump to avoid the bird, juggle the bird in the lower right to time the spinner and homing cannon combo, wall jump up the stair with the intent of getting a low wall jump on the left wall, which is needed so you can hit the third wall jump at the top to head towards the totem. This is the medium trap set for this layout. Note, the lower spinner's pivot is 11 units away to the west. Playing around with the spinners made me discover a new position in the upper right that requires a long jump to avoid. While I think it would be a pretty good killer, it required the door to be in the upper row which provides a somewhat easier path than climbing out of the lower stairs. Also, the fast start jump spinner position does really well in the lower left as its path provides extra coverage along the column climb. After deciding on this start, the totem position was picked for the same reason as #16 (third jump required when climbing the column). Homing cannon defend the climb from the corner again. The second spinner here isn't as good as the spinner in #16. It's arc covers the first jump and the landing of the third jump, however, the second jump has a wider window since it doesn't cover one unit of the wall. It is definitely the weakest trap by itself. One small plus, is that it covers all the waiting corners in the stair and can catch careless thieves. Full Solution: fast start jump (need best speed here), quick wall jump then delay before next wall jump to time the climb, start with a higher first jump to a slight wall slide to bait the cannon before making the last two wall jumps. I'm not sure which setup I'm gonna use (#16 or #17). They seem to be equally hard. #16 may be more inviting since upon first glance it doesn't seem hard. #17 on the other hand has that fast start jump which is very efficient against those with a slow double tap. It's a good problem to have when you have two layouts that you feel are hard. Update: #16 is superior. In #17 the weakness of the higher spinner location is definitely more noticeable after more testing. Now that this information is public (http://forum.kingoft...istent-spinner/), I started to play with some positioning and found one (happened to be the same type as the post, but different terrain) that I could be happy with. Note that there are 2 spinners in the same location. This location will force 1 death minimum. It also does a decent job covering wall jump 1 and 3 of the column climb. Cannon is in the same position as #17 defending the climb. We'll see how this fairs, haven't had any raiders yet. 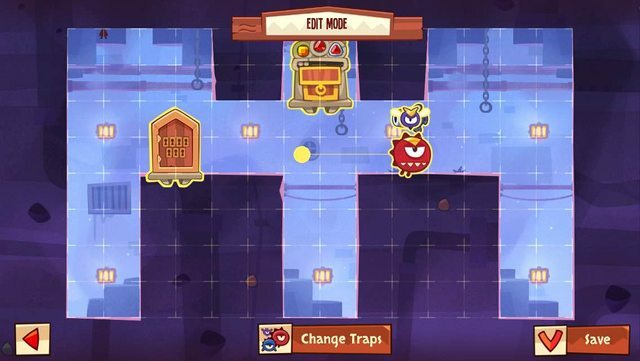 Full Solution: jump right before spinner hits you, restart, fall through, wall jump up stairs, then column climb just like in #17. Update: Just like #15 very weak against gang of thieves potion. In the future, the position isn't strong enough to justify using 2 spinners at the same place (unlike #14's spinner). Last layout in my single player. There's a nice big fork in middle. Playing around without traps showed there to be two nice totem positions with a third one utilizing a saw trap. I chose the left position because the trap placements worked better with that path. The seeker bird position is the same I used in #16. I feel it's a strong position to make the seeker bird good on its own. The cannon had no strong individual position besides protecting elbows. The saw is my second choice position. I originally wanted it 2 units right and 2 units down, however, I wasn't able to save it. Maybe I'll be able to save it in the future. I'd adjust the cannon to be 2 units to the right and 1 down (inside the wall shooting south) if I ever do. Full solution: fast start jump (not max speed as it will die, but a little slower), ceiling bounce to avoid the bird, wait at left wall to time cannon, 2 wall jumps to climb column and end up moving left. 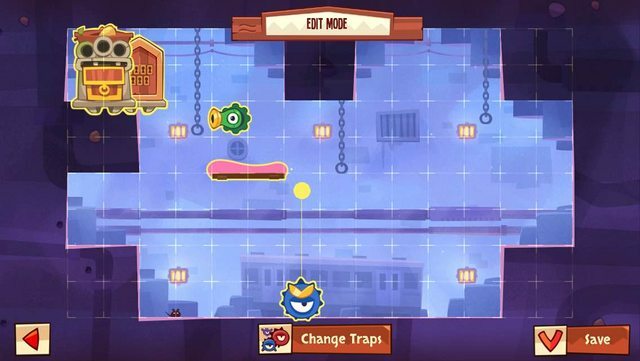 Hop over cannon bullet to setup a wall jumps into ceiling bounce and aim for right most edge (corner) Jump from corner to clear the saw. Glide off the left cliff and wall jump when you hit the wall. This is the alternate trap set for this layout. Seeker bird gets same placement as #19 just shifted left. Cannon still doesn't have a great place to be and so is relegated to support duty by helping narrow the climb vs the homing cannon. Homing cannon is in a classic defend the climb from the corner position. I tried this setup up the column on the right using the fork in the middle, however going down the wrong fork path didn't make it harder. Full Solution: fast start jump (not max speed as it will die, but a little slower), ceiling bounce to avoid the bird, delayed wall jumps to climb up stair and column. Fairly straight forward, just small windows to do everything. This is significantly weaker than #19. I just wanted to see what I could do with the set of traps. Edited by Cylence, 30 April 2015 - 03:01 AM. This is a great layout that includes a pit (on the lower left) and a wooden platform. So much to play with! Note that there is a Red Guard behind the cannon (pivot 4 spaces up) and a platform between the saw and cannon. Upper left corner is the best position for the totem, however I had to adjust this totem in order to be able to save a fast fall start. The saw has a bunch of great positions here. I could have used a similar position as #19 along the top row, however, I wanted to do something new and combine it with the platform. I came up with what you see above. It's still a pretty hard jump and not very common to pass. You have to hit the platform and then aim for the corner or else you go careening into the pit. I'm pretty happy with it. The timing is still pretty tight to execute correctly. The fast fall start (where you die as you are beginning your jump so that you can fall faster on your next attempt) has some shortcomings when placing traps to take advantage of it. 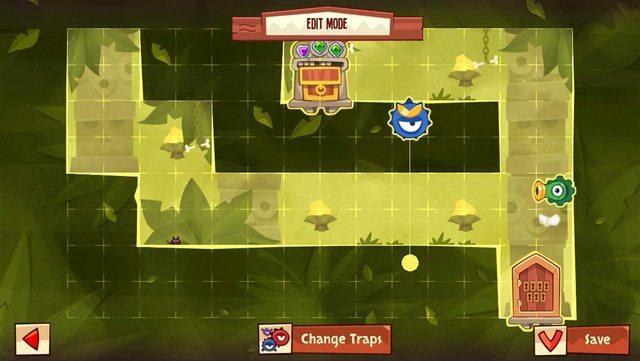 You usually need two traps to cover both options. Luckily this layout has a pit to cover the one of the options and allows us to experiment with the cannon and red guard covering the second option (passable once fast fall start is enabled). One quirk about this setup is that you can only enable it by dying to the cannon. The red guard doesn't give you room to wall jump and die to it. This means that once the cannon is gone, I don't believe there is a way to pass the red guard. There might be a way if you are in the raid: you hit the lower button "redo" right as you wall jump, but I haven't confirmed if that can work like it does when you die. #18 uses the same fast fall start and was susceptible to a gang of thieves potion. I'm not sure if this one will have the same failings since the fall has some very good coverage. The wall jump might provide an escape for a thief who is displaced so much that he can climb up the column. We will have to see how it fairs, and I'll update with new info. Full Solution: jump right as the cannon hits you, restart, fast fall through to the right, timing wait then jump along the wall. slide down until you reach near the ground then wall jump towards the platform. Jumping again to clear the saw, but land on the corner to rebound and climb up the column. Will need to do a delayed last wall jump to avoid a bullet. Then hop over to the totem. In order to save this configuration, you'll need to reach the totem at the beginning of your jump. The totem is placed in a way to allow you to do this by doing a dive jump into a wall jump. 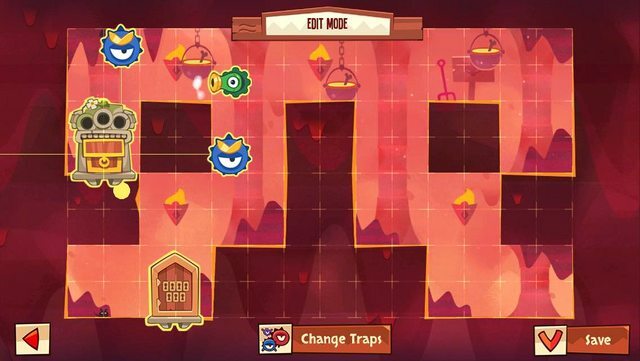 The timing is really tight in order to get a good save and pass the beginning traps. Update: Confirmed that this is not weak to gang of thieves. It will kill all copies on the way down. And no copy will displaced enough to make the starting jump up the column. I've been upgrading traps, so I haven't been able to test out the alternate set of traps. Although I have been playing around and there's definitely a slew of good options in this base. Pits and Platforms rule. This is not better that #21, however it was fun thinking up a new way to combine the platform into a difficult saw jump. Normally you wouldn't be able to pass this saw, but the platform in the wall allows you to do so. If you end up missing by jumping too early when timing the edge jump of the platform, you head towards the pit. The red guard is in it's classic row killing position and provides yet another defense to climbing up the column. The cannon was hard to place effectively. It cannot defend well on its own in any position before the saw, so I just relegated it to helping defend the climb. 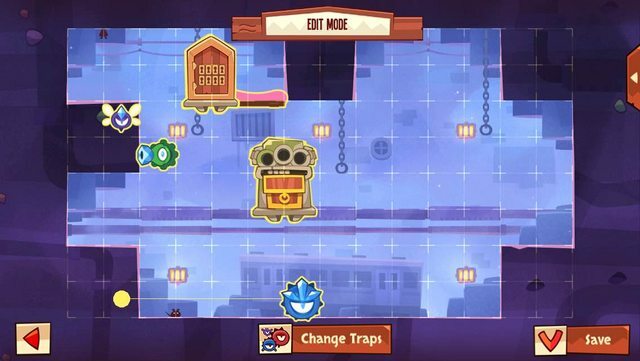 This setup should be susceptible to disable trap should the cannon be the only active trap after 7 deaths. I also tried moving the saw and platform up one unit because if you miss the platform on the first try, you don't get to try it again. However, I was unable to clear the saw from that position. I believe it has to do with the fact that you are hitting a corner and there are some limiters there. Full Solution: fast start jump, second jump hugs the red guard. time a rebound jump to avoid the cannon and wall jump over the red guard. slide down till you hit the platform edge, jump up along the wall and then at the peak wall jump over the saw. one more wall jump should get you to the top row where it's a few island jumps away to the totem. I'm almost done with my teeth here and I haven't even gotten to play with the alternate set of traps since I've been upgrading. Maybe I'll stay for a bit and upgrade the seeker bird. This is the alternate set of traps for this layout. Note that the seeker bird and a cannon pointing north are overlapped. All three traps are dedicated to the fast fall start. You can't overlap #21's red guard position with the seeker bird here because the displacement of the bird makes it impassable. I moved the red guard to the right and worked out timing that would punish non fast fall starts. Basically you need a little more time to escape the red guard coming down and the fast fall gives you that time. This set is still weaker than #21 because the buzz saw provides more variety. 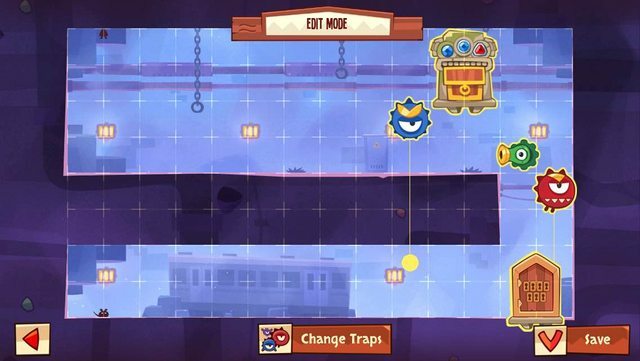 Also, you can activate the fast fall start with any trap here, where as in #21, once the cannon is disabled, you can no longer force yourself to die to the red guard in a similar manner. Full solution: jump right as the cannon hits you, restart, fast fall through to the right, very slight delay before doing a quick wall jump into ceiling bounce to avoid the red guard coming down. wait till your character hits the left wall before climbing up and across to the totem. I will probably come up with one more set of positioning with these traps that doesn't use the fast fall start. While this setup can do well, it is not recommended. This is merely a display of situations you can create using the platform. The red guard's pivot is 3 spaces north. All three traps make use of the platform position creating a very small window to escape from the alcove. I wanted to find better positions for the seeker bird. The bird is good at catching thieves who have been cornered. I started experimenting with the platform to create a situation that could help corner the thief. The pit on the left provides awesome support and makes this placement possible. To climb up the column you would usually want to wall jump off the left wall as high as possible. The platform increases the time you need to setup that jump from the ground. You can get a high wall jump off the left wall by jump off the platform slipping under the hanging corner making sure not to head towards the pit. The red guard is setup to punish waiting in the corner and to defend the corner that needs to be hit to climb up. The cannon does a similar job. 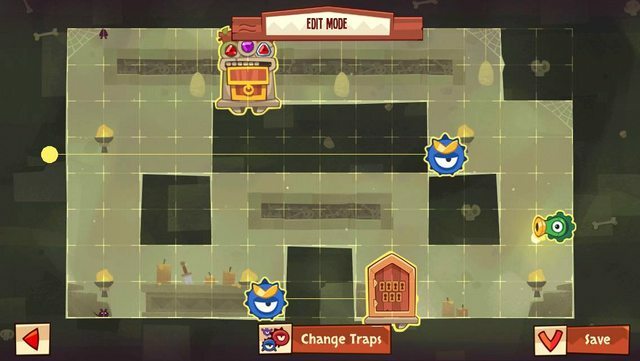 All three trap positions can defend decently on their own if the thief cannon make the platform to corner jump easily. So you could use this positioning and mix in different trap positions to make a harder defense. Extending the red guard's pivot 2 units north makes his individual strength weaker but a much better support trap. Full Solution: fall towards the right wall. wait for bird to get close, hop up along wall and slide down, only jumping right before bird can hit you. 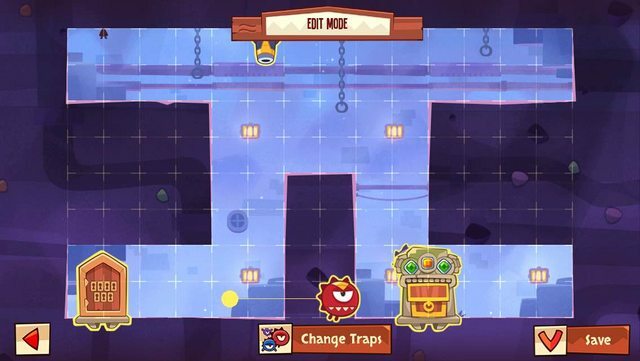 jump from the platform aiming for making it underneath the hanging corner so that you can wall jump off the left corner. easy wall jump climb up the column and across to the totem. Note that there is a buzz saw positioned on the lower right of the totem. 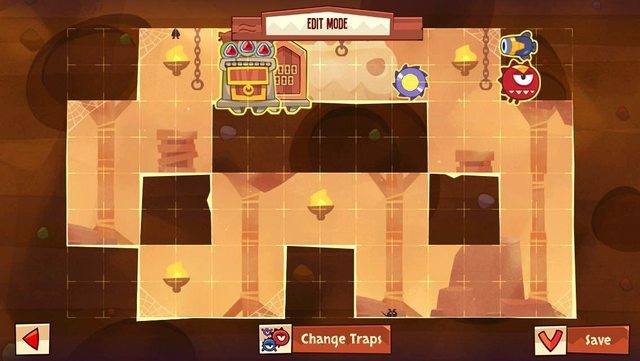 This layout has 2 possible totem locations in the upper left or upper right. The upper right was chosen because of the spinner location. This spinner is the same as #14. I've found some alternate arcs that force the same timing and may play around with them to see which one is best. I feel that there's only 2 places (4 with mirror locations) to place the buzz saw. One, is right above the bottom row to force a high wall jump and the other is the one I used (requiring a jump of faith or edge saw jump). The homing cannon was a difficult one to place for me. I've gotten used to the homing cannon and positions I've felt were harder to time before, seem like a cakewalk nowadays. There are some strong positions where it can hold on it's own when forcing timing with the door. However, I chose to prioritize the spinner position for that purpose. So, this homing cannon is just providing support to protect the saw jump. Most of the time the spinner will be 7 death disabled, leaving the homing cannon and saw pair to defend. Full solution: low wall double jump, walk to left side, once you hit the left wall, you time the rebound jump to avoid the spinner on the way back. Once you are on the right wall, slight delay before you do a jump along the wall. Wall jump at max height and if you timed everything perfecting you could just mash jump all the way through. You'll end up jumping through the homing cannon to avoid the bullet and doing the edge saw jump to finish. Alternate trap set for this base layout. Given the spinners, I tested out a few fast fall positions that I wanted to try out and found an additional position that covers both the jump and the fall and allows fast fall. However, the totem positioning in this base makes it difficult to find a way to save it twice. The homing cannon seems to be the toughest to place and have it be effective with two spinners. You could place the homing cannon 2 units above the left side of the door (placed in a right corner) with the spinners forcing a jump, however the solution only involves 2 jumps (http://forum.kingoft...l-jump/?p=44238). I wanted to force 3 jumps at the minimum and I started to focus on the homing cannon. The regular homing cannon jump is always a staple and the long row on the bottom led me to believe I could set up the spinners to also use the forced path from the door. The first spinner (pivot is 11 spaces west) just forces a fast start jump and was easy to combine with the homing cannon. The third jump was harder to nail down. This is because it has to be decently strong even if the other two traps are disabled. I played with the door a bit to adjust the length to the right wall and came up with a position for the second spinner that can be solved in two ways. Either going over or under, however both paths are decently tight in timing. 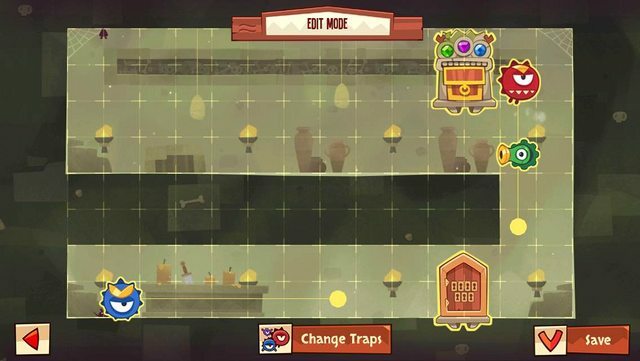 Once the other traps get disabled, it gets a bit easier but it still isn't trivial. Full solution: Fast start jump, homing cannon jump (jump as it shoots to dodge), either a low wall double jump or a max height wall jump timed for a specific part of the arc. If you did a low wall double jump, then on the way back just one more jump to dodge the spinner on its return then climb up the column. If you did the max height wall jump, then climb all the way up, and time your dive in to avoid the cannon bullet and left spinner (trivial), then climb up to the totem. Up the column is the easier path if you can manage it, however I saved it with the low path so people who use the ghost potion will try to execute that one. Update: Slight weakness to gang of thieves. Displacement is enough for the first spinner to be bypassed, and the homing cannon has always had a weakness aiming at a bunch of clones. Second spinner is enough to smash all copies. Does decent against disable however, both disable and gang did a number on it. I did notice that people like giving this setup a lot more tries. I've seen a consistent 60+ attempts with some passing and others quitting. Note that there is a buzz saw on the lower right of the totem, and the spinner's pivot is 5 units south. I wanted to play with the long row before I have to move bases. My focus was just like in #26: I wanted the homing cannon to do well on it's own, and adjust the spinner to also have a strong individual presence on the way to the homing cannon. It may be just because it's new, but the homing cannon feels harder than the standard homing cannon jump in #26. My guess is it'll still fail to gang of thieves, simply because the homing cannon doesn't know what to aim at. However this layout allows the placement and it was fun discovering. I adjusted the door's height to control the timing ever so slightly. It also helps provide a little help shooting upwards toward the buzz saw. The spinner position feels very strong. I'd say the timing is as tight as the second jump of my standard red guard row opening (#6, #11, #15, #22). What makes it rather difficult to time is the fact that the spinner is off screen and if you can see it, it's probably too late to avoid it. The arc has an added bonus of annoying the approach to the buzz saw. I think this will fail to gang of thieves as well but won't know for sure until I see it happen. 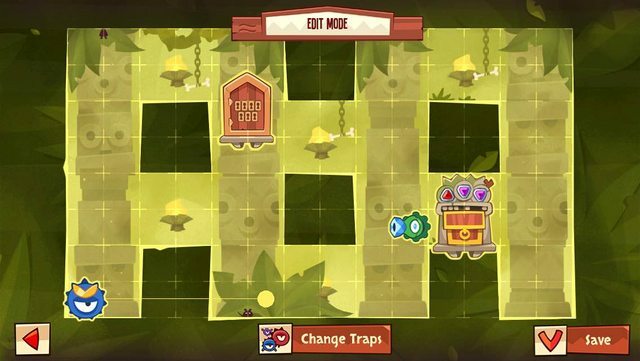 If it's strong vs gang of thieves, then it might be strong enough to warrant a double spinner placement with the alternate set of traps. Full solution: timing jump to avoid the spinner, a jump into the cannon to land just pass the eye into a second jump as soon as you hit (if you did it right the cannon would spin and shoot the ground as you jump), slide down the wall and time the climb up to avoid the blue spinner, wall jump to the top and either jump of faith or edge saw jump to finish. Update: wish I had more time with this setup. Was not able to confirm if gang of thieves worked on this or not. Was on my last set of teeth and I usually speed through the last ritual so I can get to a new dungeon. I'll revisit the spinner position in the future if I am blessed with a long row. This is the second time I've had this layout (#7, #8, #9). Let's try something different. This is the alternate trap set. There are two spinners in the same location. I wanted to use the fast fall start spinner position that I found while making #26 (but couldn't use due to limited totem placement). Primary function of the spinner is to force the fast fall. You can actually shift the door and spinner down 1 unit and it'll work the same. I chose the upper position because the arc for the spinner position covers 2 of the jumps needed to get to the totem after they fast fall through. It's fairly easy to do with the spinners on it's own, but they provide support to the homing cannon timing. Trying to come up with a homing cannon position was tough and I settled on the upper corner of the stair because it's easy to miss-time and get stuck right below the cannon with no time to do the homing cannon jump. Anybody that can do a homing cannon jump will need to time their climb to make sure there's room to perform the jump. Full solution: die to spinner (max squished state), reset and fast fall through, slide a bit before timing two wall jumps to get over the cannon's bullet, this should set you up to slide to the left side of the stair and leave you enough time to jump through the homing cannon safely, and rebound off the opposite wall fast enough to get under the spinner's return path. 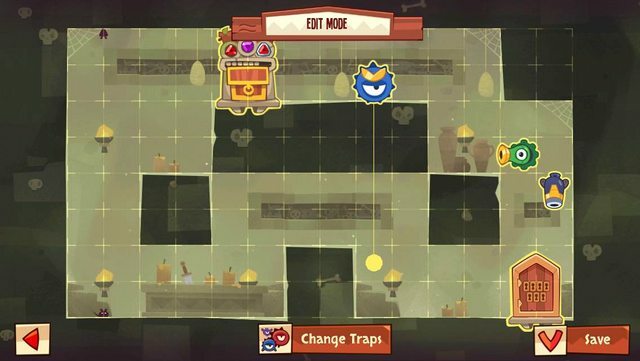 To save this layout, you'll have to do an extra jump kinda near the drooping light/chandelier to land right next to the totem, hitting the treasure chest just as you jump again. This spinner position is tighter than the fast fall spinner position in #18 and I'm curious to see if it has a better chance vs gang of thieves. Will update if it does. Update: Confirmed the tighter timing doesn't have the same weakness to gang of thieves. All copies get crushed. This spinner position is superior to #18 (along with being harder to save). Non fast fall start configuration. This reminiscent of #7. 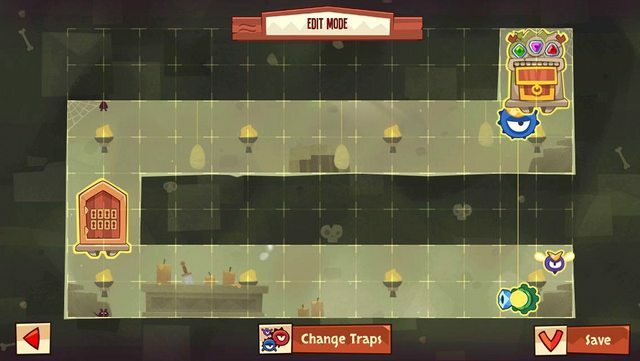 Two traps to force the low wall double jump, and classic homing cannon placement. Wanted to focus on making the regular cannon more effective here. This is what I came up with. Lightly forces low wall double jump and will kill attempts that are late before the spinner does. Spinner is the #14 position. Should the spinner get disabled, the climb up the column still needs to be timed really well as the window is very small. Still using #28, as it is definitely stronger. Wanted to come up with something if I had to use this trap set though. 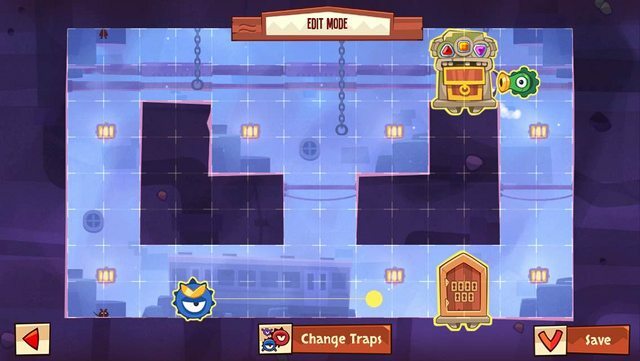 Full solution: low wall double jump, wait on left wall to time the climb up, jump over bullet and rebound on the lower half of the wall underneath the homing cannon, timed correctly you should be under the next round of bullets and have an easy time from there. Will need to jump right away after jumping over the homing cannon, then climb the stair to the totem. =( Repeat layout (#10, #11). Getting lazy with this one. Throwing up #15's classic combo with a return path. Should be good enough. Full Solution: Same as #15, except the return requires a timed edge saw jump. Here's to hoping I pick locks for plenty of orbs so I can speed past this layout. Edited by Cylence, 01 May 2015 - 09:24 PM. Note: there is a buzz saw on the upper left of the totem. This base has somewhat of a pit, since when you leave the top row, you can no longer reach it, however, there's no way to utilize it to our benefit. This is actually a repeat layout for me (had this same one before I started recording my trap positions). I put the door on the cliff of the upper right and used the cannon and red guard to create a tight squeeze and return back. The buzz saw was at the top of the ledge which forced a max long jump (pre patch) to be performed in order to clear it. This time, I was hoping to find a good place for the cannon where it could do very well on it's own, but all I found was some non perfect low wall double jumps. Ended up placing buzz saw to force a very tight dive jump and also serve to cover up the left side of the totem. The red guard is in classic #6 position (it still works fine even when the guard spends half his time in the wall). I adjusted the cannon to perform a very loose low wall double jump, but works with the red guard to make the thief have to go back toward the door before attempting to climb the column. I considered some red guard positioning with the door 2 units off the floor on the right section of the lower row, however, the current configuration proved to be the harder one. The current red guard positioning is being more widely used and figured out, however, the jumps are still tough to perform. Full solution: fast start jump, timed jump to clear the red guard, wall jump as soon as you hit the wall to duck under the bullet, wait a bit before launching off the left wall to time the bullet, wall jump up the column aiming for the top left corner of the center pillar, dive jump from just past the outer edge of the corner to get by the saw. Note. There is a cannon pointed south underneath the seeker bird. This is the alternate trap set that came with this layout. The saw in #31 makes that layout way stronger than this one. Both the cannon and red guard hold the same position. The seeker bird is positioned to force a low wall double jump just like the cannon. Totem was moved to a harder to reach location. I just wanted to see what I would do with this trap set if I had to create something. I used #31 since it was way stronger. I tried some setups with the door on the upper row and played around with having to go right than left through the same set of traps. However, the red guard position is just too strong in comparison. Placing the red guard anywhere else just didn't seem to make sense. 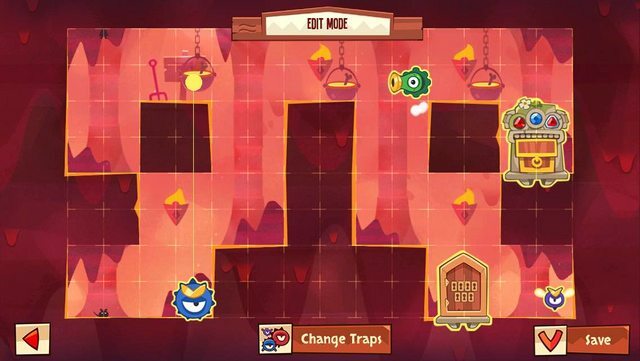 Full solution: fast start jump, timed jump close to red guard, slide a split second toward the corner then wall jump back to the left side, wait for the seeker bird before jumping along the wall then climb the left column up. From here you can some delayed jumps to get to the totem, however, I prefer just heading to the right side and climbing the right column so you don't have to deal with the cannon shooting down on you. Note: there is a homing cannon behind the upper left of the totem. I ended up getting a layout I've already discussed but never had actually tested. http://forum.kingoft...ylence/?p=45231If you read that reply, Option 1 failed horribly as expected. Option 2, there were some okay setups. 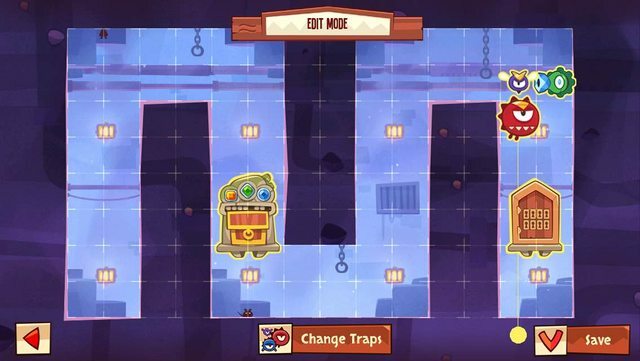 However, I just decided that I wanted to upgrade one of my traps, so I just decided to go with Option 3, with 2 spinners in fast fall start position and the homing cannon to be upgraded and placed over the left side of the totem to conceal gems. Also, I specifically placed the totem in an area that will also conceal gems. When you are raiding you usually see a "tap to break in" with a pad lock graphic. This graphic conceals the middle and right side of the totem's gem slots when the totem is positioned like above (I believe it's full coverage, however the right slot may be slightly visible). Most likely this won't deter raiders, because I've only got 7 normal locks and I usually float a bunch of coins. However, why not place it there for those who aren't interested in coins. Full solution: trigger fast fall start, then just a simple path to the totem. Update: oni reminded me that languages differ so the padlock won't always be in the same area, so hiding your gems behind it will only affect english users. Didn't get to play with this trap set too much cause I was upgrading the homing cannon with the other setup (did get to play with #9's layout with 2 spinners and it does okay here if placed in the center lower row). I tried a fast fall start setup with the spinner and placing two traps to do the same thing, but #33 just seemed superior that I wanted to do something without a fast fall start. I tried to see if there was any other terrain I could use to my advantage of besides the center lower row, and ended up finding a variation to the regular low wall double jump regular cannon placement. You'll notice that this position is similar to #31 and #32's regular cannon, except the door is just elevated. 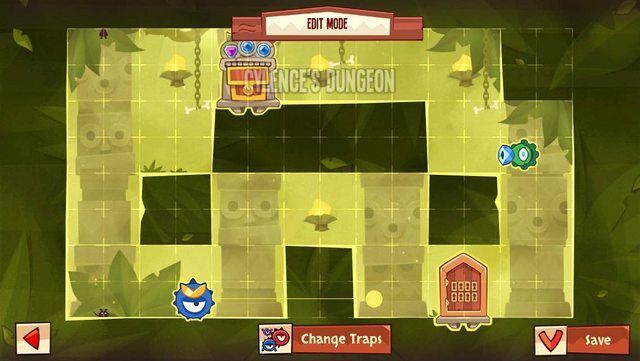 This dungeon is pretty hard to come up with 3 strong individual traps, so I decided to take the same route I did for dungeon #15, where I would just rely on one good trap position and the other two would be support. I positioned the homing cannon to support by tightening up the corner aim as it punishes everything that will get past the reg cannon except a perfect low wall double jump. The spinner supports by blocking the shortest wall jump to the totem and also any late jumps when aiming for the corner which protects the regular cannon from being disabled. Overall this isn't too strong a defense, but it was different and fun to experiment with. People will eventually get it, but it still caused 7 deaths even vs disable pot and gang of thieves combo. One drawback is that since the totem is so close, if they use a disable pot, and get to the totem by just jumping over the homing cannon when its the only active trap, then you don't get to watch the whole replay. 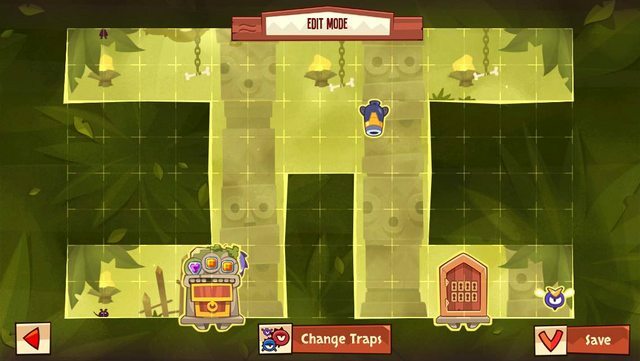 Full Solution: Low wall double jump, wall jump, wall jump. Rolled the same layout exactly (except for background). Trap sets are identical too. This dungeon is still rough to design for. Too many multiple paths everywhere. Note that there are 2 spinners in the same spot. Just playing with the spinner some more and was able to find out a nice spot for it that forces some good timing. You need to jump at the right moment to allow the spinner to pass underneath you. I've dealt with double jump variations of this, but I usually only had a thin row to work with. This time I have a bit of extra space to test out two different set of timings (door 1 or 2 units off the ground). This spinner setup is much better with the door lifted 1 unit, vs being on the ground or 2 units up. I tried placing the homing cannon to protect the spinner from getting disabled, but there was nothing tight or great about it. So, I decided to place it to catch anyone who happened to clear the spinner. If you clear the spinner in the right way, you should be able to do a low wall rebound (with the lean) to avoid homing cannon, if not, then you'll die because the rebound will be too high. You can also not do the low wall rebound, and instead time the homing cannon jump, however, this is pretty hard to do as well. Full solution: timed jump to clear the spinner, low wall rebound. 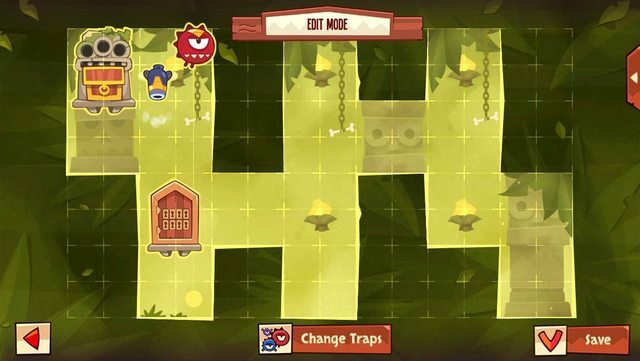 After that it's pretty easy, wait for the spinner and climb the second column to the left and dive jump or bad dive jump into the totem. Will be looking to see if I can pair this spinner location in the future with other things. As I suspected, the seeker bird has a great position here chasing down a thief that will begin on a wall, and eventually trap him unless he can quickly jump off the ground along the wall and wall jump under the bird. Just as I said in my response, the red guard was hardest to position. I originally did a #6 red guard placement along the center bottom row when I didn't have time to save a better layout. However in order for the seeker bird to be strong, the door needs to be in a certain place, and there's no real position where the red guard can defend well on it's own. I ended up trying to place the red guard in way that it punishes mistakes when trying to pass the seeker bird. Finally chose this path that will kill any jump the thief tries to perform while sliding down on the wall. The homing cannon also had no relatively strong individual position since there are no forks to tighten the dodge timing. So, I placed it to work with the red guard in making the climb up the column pretty tough. 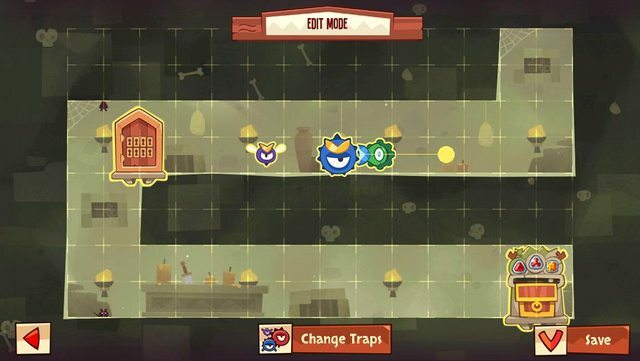 I'm worried how this setup fairs against gang of thieves, since both the seeker bird and homing cannon are weak to that potion. We'll just have to see how it plays out. I'm hoping the red guard is the 7 death disabled trap as its position is the weakest. Totem could have been placed in the far bottom left corner, but I just placed it where the text would obscure the gems. Full solution: slide down, jump as soon as you touch the ground and wall jump getting under the bird, a series of delayed wall jumps to climb up, a homing cannon wall jump, then a dive jump to beat the seeker bird down. Updated: As I feared, gang of thieves does well vs this. The setup kills every clone but one if they jump correctly, and that one has an easy time up the column. This setup did pretty well vs disable pot, and the red guard has been getting some disables. Overall it forced some zero stars and is pretty good except for the weakness to gang of thieves. This is the alternate set of traps for the layout. #36 had a big weakness to gang of thieves. I was trying to figure out how I could fix that. Both the seeker bird and homing cannon have the same positioning as #36. I had to find a spinner location, that punished the jump, left the corner, safe, and would also punish clones coming late out the door from gang of thieves. I haven't confirmed if this position does, however it's path makes me believe it should. It allows the thief to slide into the corner, any of the copies that come after should be late. After the seeker bird is disabled, this gets easier, however, the path of the spinner gets bonus kills for careless thieves diving down the 3rd column. I forgot to get a screenshot before my totem collapsed, just thought of it before moving on. Full Solution: same as #36, except after the homing jump, you'll have to delay the dive jump to avoid the spinner. Overall, this should be superior to #36. Note: there is a buzz saw on lower left of totem. I just ended up using three classic positions for this layout. Seeker Bird row end (#16), Homing Cannon corner climb (#4, #7, #12 #14, etc), and Jump of Faith buzz saw. You could move the totem to make it a saw edge jump only buzz saw, but I got lazy and saving this was easier. 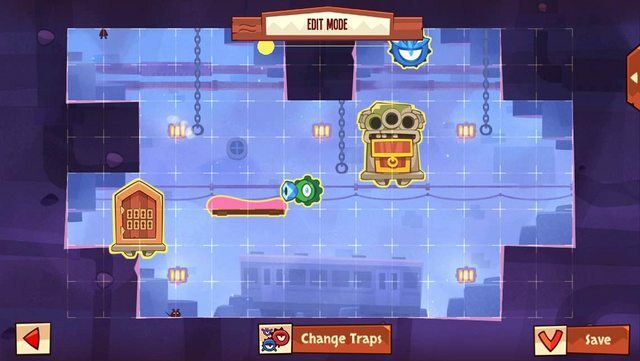 Full solution, semi fast start jump, jump along wall and ceiling bounce to get over bird, some timing jumps to slow down, aiming low on the wall for a climb that dodges the homing cannon, slide a bit before doing a jump of faith to pass the buzz saw. Spinner #14 can work on the right side of the top row. I considered using it, however, I wanted more time with #27's spinner. So I set up the homing cannon and the spinner just like in #27. The seeker bird was positioned to hopefully take some deaths from the other two. I actually plan on upgrading the seeker bird, so I may move it over the totem. The homing cannon tends to kill any copies left from the spinner when the thief uses gang of thieves. Full solution: timing jump to avoid the spinner, homing cannon jump, wall rebound to get over bird, need to do it fast enough to beat the spinner on the return, simple climb up and if your timing is right, don't have to do anything to avoid the spinner again. I may explore this layout more, but these are quick ones I put up to display that individual positioning that I've used before transcends a single layout. 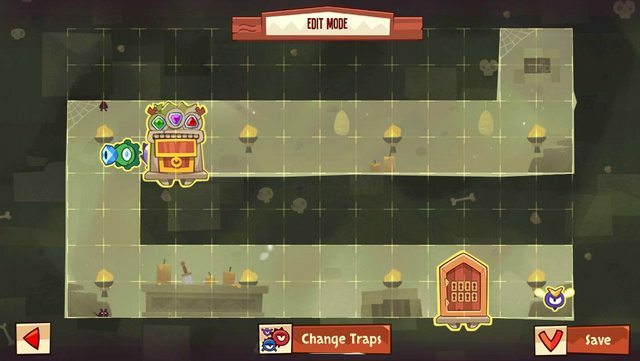 Update: after further time with the traps, gang of thieves is still strong against it. This was the layout I came up with when trying to figure out how to put spinner #14 in this layout. I couldn't fit in a homing cannon with #14 so I went to my archive and pulled out this jump over option spinner, which is easier without the cannon but pretty hard with the cannon. Homing cannon is in classic 6 unit homing cannon jump position. The seeker bird is support only and helps the homing cannon a little, but really shines when helping the spinner. This setup is less susceptible to gang of thieves and holds pretty well. I would definitely use this over #39, but would still use #38 since it has 3 strong positions. Full solution: jump when seeker bird is close, homing cannon jump, timed max height wall jump, ceiling bounce to slide on the right for a bit before repeating the same wall jump into ceiling bounce to juggle the bird twice and avoid the spinner coming back, then slide down some more and wall jump to the left, depending on the timing you may need to jump for the homing cannon, then a dive jump and rebound to the totem. Thanh and I had a discussion about this dungeon and he has a different seeker bird positioning that is also effective (3 units to the right of my seeker bird). Edited by Cylence, 27 May 2015 - 05:33 AM. This is a repeat layout of #31 and #32, however the trap set is different. Note there is a buzz saw on the upper right of the totem. I discussed this layout in this post here: http://forum.kingoft...update/?p=33244 and Sussu ended up taking my advice and testing it out. Found that the lowest position for the cannon makes a good support for the seeker bird timing and can be decent on its own. Buzz saw is in the same strong position requiring a hard dive jump. Seeker bird positioning is the same dead end trap in #16, #19, #20, and #38. Full solution, semi fast start jump into a relatively quick wall jump into ceiling bounce, if it isn't fast enough you won't be able to escape the reg cannon with a perfect low wall double jump, once you have rebounded, wait along the right wall before heading towards the reg cannon again. 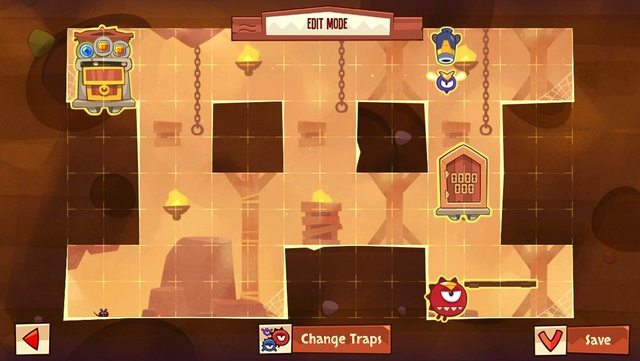 climb up the column with wall jumps and perform the dive jump to avoid the saw. Note: there is a buzz saw on the lower left of the totem. I'm getting lazier with my setups. I tried doing an edge saw jump (without a corner to help aim), but didn't have the patience to save it twice. Cannon and red guard have no good individual positions, so they are working together to make a difficult climb. Buzz saw in the same leap of faith position. Full solution: wall jump, delay and time a jump, then quick wall jumps up, delay and time a jump of faith. Note: There is a seeker bird in the same spot as the regular cannon. This is a reimplementation of #36, although significantly weaker since the regular cannon doesn't pose any extra threat. The seeker bird position is really good and the other two traps are just placed in away to try to steal kills from the bird. You could set up the red guard and regular cannon elsewhere in combination, to force more thinking. I played with an alternate configuration that forced a low wall double jump in the center column (with the door high on the left column and the red guard positioned underneath), however it didn't feel better than this one. 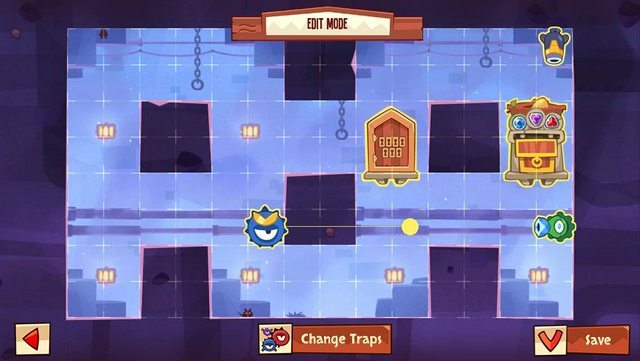 Full solution: slide down, jump as soon as you touch the ground and wall jump getting under the bird, after that it's easy wall jumps up to the totem. I think this setup should work better than #36 when faced with a gang of thieves potion. I feel that this one is better than #44. The seeker bird is placed the same position forcing a tough first jump. The homing cannon and regular cannon had no great individual positions and are placed to work together to make it tough to climb up the center column. Moving from left to right can be dangerous as well as falling into the bottom of the second column. Without the seeker bird, there are two different ways. With the seeker bird you can only come from the left and can't climb out the bottom of the center column. 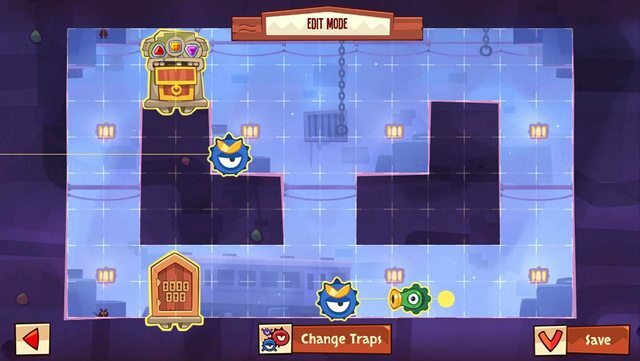 Full Solution: slide down, jump as soon as you touch the ground and wall jump getting under the bird, then wall jump up the left column and head for the leftmost wall, do a high wall jump and aim for the bottom right corner or the left column so that you can do a rebound jump to the left side of the column. Slide down and time a jump to hit the corner and double jump on the 2 unit wide terrain with the 2nd jump being a homing cannon jump that dodges a bullet. From there, two simple wall jumps should lead you up and towards the totem. Note: There is a seeker bird in the same position as the regular cannon. This layout allows two ways to approach the best positions for the totem (2 units from the upper left and its mirror position). It does have a long row on the bottom that could be used to setup 3 traps in succession. I played with a few that had the regular cannon forcing jumps, however, without the regular cannon forcing jumps, it was pretty easy. Since there are no dead ends or long columns, there's not many places to position the seeker bird to be effective on its own besides forcing a low wall double jump. This particular set of trap positioning is pretty popular right now, I've ran into it multiple times across different layouts. It's basically a loose low wall double jump forced by the regular cannon and seeker bird, that is supported by the homing cannon which not only tightens it up but forces a homing cannon jump after. I did find another great position for the seeker bird, however, I couldn't find a way for the regular cannon and homing cannon to work well even when combo'd to protect the upper corners. Full solution: low wall double jump (close to perfect but not perfect, since you don't want the extra speed and lean), jump over the homing cannon bullet, one more jump to slow down, homing cannon jump that starts just as you pass the center of the homing cannon, climb the column with a few delayed wall jumps so you can travel on the upper level, should be a breeze to the totem after this. Since the above is so popular, this alternate version does well for those who are used to beating #46. The seeker bird is placed to force a perfect low wall double jump (with lean and speed). The regular cannon is still in the same loose low wall double jump position, however, the homing cannon has been adjusted to allow the perfect low wall double jump to live. It still forces a homing cannon jump however, it requires no slow down jumps to bypass. You still need the extra speed from a perfect low wall double jump to pass it though. So if the seeker bird gets disabled and the thief performs a less than perfect low wall double jump to pass the regular cannon, he wont be able to pass the homing cannon since he lost out on the extra speed. I feel that #46 and #47 are about the same strength. I believe that in #46, the homing cannon is more likely to be death disabled, while in #47, the seeker bird well be death disabled. 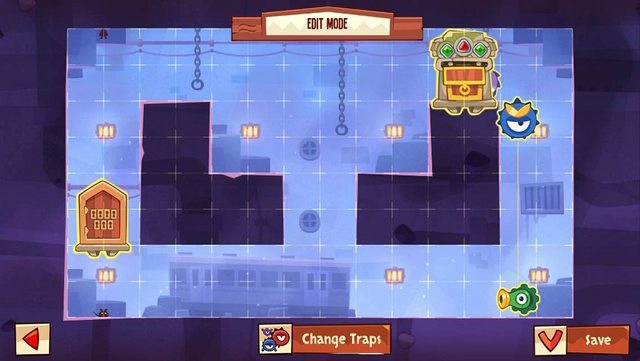 Full solution: perfect low wall double jump, jump over homing cannon bullet, homing cannon jump that starts as soon as you over lap the front of the homing cannon, climb up the column with a few delayed wall jumps so you can travel on the upper level, should be a breeze to the totem after this. This is definitely not as strong as #46 or #47. I just wanted to showcase this great seeker bird position that forces a perfect slide to low wall jump. The totem is in a suboptimal position because the spinner does better on this side because of its clockwise direction. It would be better one unit to the left, however that would mean an easy win because of the door placement for the seeker bird. The spinner is placed to protect the corner as well as providing extra protection if the thief gets past the seeker bird. Once the seeker bird is death disabled, the spinner also prevents a quick wall rebound to the totem. The homing cannon has limited positioning because of the door placement, and was focused solely on supporting the spinner in protecting the upper right wall jump to the totem. This was the best position considering that the thief can come from 2 directions. Full solution: slide down the wall, jump as you reach the corner to get that lean and speed to get under the seeker bird, do two slow down jump to avoid dying to the spinner, from here you can take the high road, although I've found the timing on the bottom row to be easier so do a low wall double jump (doesn't have to be perfect) so that you jump over the bird and don't slide on the hanging corner too much, jump over the incoming spinner, then lean on the right wall to time the climb up into a homing cannon jump (do a full jump before your first wall jump to make sure you have enough height to clear the right side, then wall jump immediately, if you timed it right, you should jump over the bullet or pass through the cannon as it's shooting), end with a wall jump into the totem before the spinner returns. Note: There are two spinners in the same location. I knew of this platform and totem layout probably a month before it was posted by Bryce (thread here). Wasn't able to play with it until I got this layout. The platform slide glitch forced you to jump immediately the first time you get on the bouncy platform. After that you slide a bit on the upper wall before rebounding into a slight ceiling tap which will give you enough distance to jump off the bottom corner where the door is and get you back on the platform. The thing to make this base harder was looking for ways to force the thief to repeat this series of jumps. In 2.4, the first jump is no longer forced as you can get on the platform without sliding. The spinner was easy to place in a position that forces 2 more jump cycles. It even works in the 2.4 update and causes 3 jump cycles. The homing cannon placement also forces 2 more jump cycles after the initial first glitch cycle. This position won't work in 2.4 though, since it allows the first jump through. I didn't end up using this trap setup because I wanted to be able to upgrade three different traps, and upgrading the spinner here would deactivate two traps. 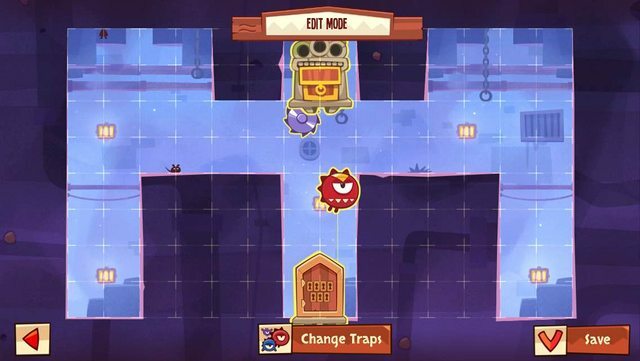 Full solution: Do the jump cycle explained above 3 times, then jump off the right edge of the platform to reach the totem. This layout has so many different and effective placements that it was hard to choose one. I played with a bunch of door, platform, and totem positions all over and wanted to use one that was less common. I ended up with this positioning because, even without any traps, its still pretty hard to hit. The only problem was that you could give yourself another try if you over jumped (you fell in the pit if you under jumped). So, I decided to put a squeeze on how many times you could try by creating a seeker bird race using the spinner. You have to get on the wall fairly quickly and make your jump before the bird gets moved in and locked into place. Of course, the bird didn't hold well vs gang of thieves, but the jump was hard enough on its own =). The spinner's main purpose was moving the seeker bird, however, it did provide deceptively decent coverage of the jump to the totem. If it didn't hit you on the wall it still had a chance to catch you on the jump towards the totem. The homing cannon was placed to protect the same wall you needed to time the jump from. 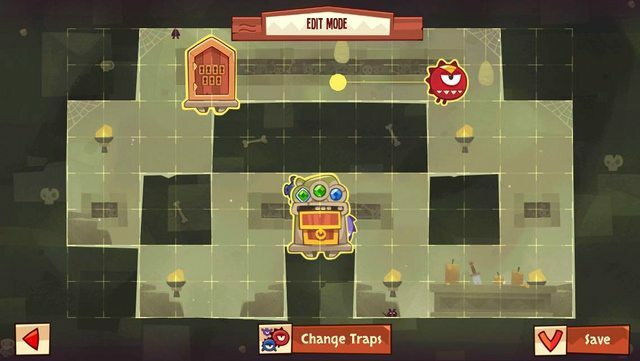 I upgraded all my traps to 20 using this setup and a very low number of 1 stars getting through it even with only 2 traps active. Full Solution: don't wait till you hit the wall before you try turning around because you wont beat the seeker bird unless you do an earlier jump. Rebound off the wall and ceiling to land back on the platform, then immediately jump again bouncing off the ceiling towards the wall above the homing cannon. You wait for a split second to get the timing down, then jump towards the totem. You will do a little twitch as you pass through the edge of the bouncy platform. Edited by Cylence, 28 August 2015 - 01:17 AM. why wont u use kotbuilder.com ??? no sorting by author to have a page that only has my images. This post had dungeon 5 when edit functionality wasn't working. It has been moved to the top. Edited by Cylence, 01 April 2015 - 12:50 AM. This post had dungeon 6 when edit functionality wasn't working. It has been moved to the top. This post had dungeons 7, 8, 9 when edit functionality wasn't working. They been moved to the top. Edited by Cylence, 01 April 2015 - 12:51 AM. Edit functionality has returned. Moved posts to the top of the thread. Edited by Betonblok, 10 April 2015 - 03:22 PM.